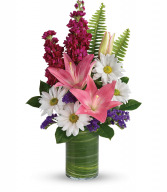 The Beyond Blue™ Bouquet is a wonderful way to send peaceful wishes to your special recipient. Bringing together gorgeous white Asiatic Lilies, white roses and white mini carnations accented with blue statice, cream spray roses, and lush greens, this stunning bouquet captivates at every turn. 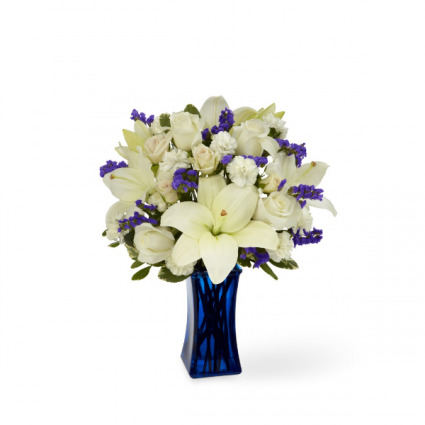 Presented in a dark blue glass vase to contrast with it's bright white blooms, this beautiful flower arrangement will make an excellent thank you, get well, engagement or sympathy gift. BEST bouquet includes vase. Approx. 17"H x 14"W.